There is an extensive choice of hearing aids allowing for a comfortable, customised fit and a much higher level of performance for the wearer. Discreet, colour-toned models improve general confidence while providing an enhanced, natural experience in almost any situation. They now incorporate technologically advanced components including wireless for even greater enhancement. Hearing aids generally fall into three categories; invisible, behind the ear or in the ear. An invisible hearing aid fits directly into the ear canal and as such is undetectable unless under the closest scrutiny. 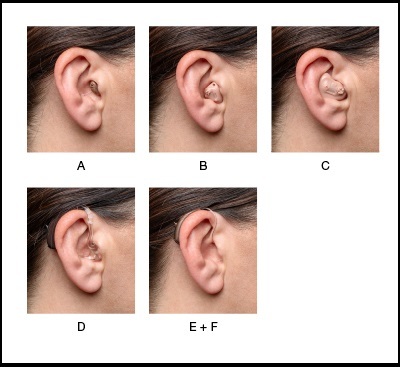 A Completely in Canal (CIC) type is suitable for all levels of hearing loss and is fully customised using an ear-mould to ensure a perfect fit. Sophisticated technology provides an excellent level of quality to the sounds of everyday life through an omni-directional microphone. The wearer can enjoy using the telephone and following conversations in fairly noisy environments such as restaurants. Some slightly larger versions, known as Mini in Canal (MIC) hearing aids accommodate wireless technology which can bring even greater hearing benefits. Invisible hearing aids require a high level of maintenance to protect them from ear wax and perspiration. Their suitability is dependant on the shape of the wearer’s ear canal as in some cases the unit can easily work itself loose through actions such as chewing or talking. This style is not generally recommended for anyone with a perforated ear drum. This hearing aid is the traditional type that places the microphone housing behind the ear and directs sound through a miniature tube that is fitted into the ear canal. However, modern units are small with sleek, comfortable designs in a variety of shapes, sizes and colours that are discreet and barely detectable. Dual microphones are usually incorporated to provide greater localisation which allows for more natural hearing during conversations. Technological wireless versions are available for an increased performance. A BTE is ideal for providing powerful amplification for those with a severe level of hearing loss. The wearer can occasionally experience interference when using the telephone. Clarity can also be reduced through a build up of condensation in the tubing although this is easily rectified by replacing this section on a regular basis. In the Ear styles have slightly larger units than the invisible versions. They are fully customised to ensure a comfortable fit through taking an impression or ear mould of the ear bowl. They still offer a fairly discreet option and are very convenient to handle particularly for anyone with limited dexterity. Advanced technology has allowed this type to incorporate sophisticated dual microphones for an increased naturally localised sound and can incorporate superior wireless capabilities. They are suitable for all levels of hearing loss and can even be worn by people who have experienced difficulties keeping the invisible style in place. There can occasionally be interference when using the telephone. Contact Hear4U for advice on which hearing aid style will suit you.